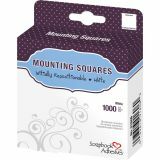 Scrapbook Adhesives Mounting Squares - 3L CORP-Mounting Squares: Repositionable. All products in the 3L Scrapbook Adhesive line is guaranteed to be archival safe, acid and lignin free, acrylic based and PAT tested and approved. This package contains 1000 1/2in white adhesive squares that are repositionable for up to 5 minutes after adhering them to photos, paper, acrylic and much more. Imported.